A warm and sunlit cottage facing south across the barley fields, Winnow has twin beds, a sofa bed if required and a pleasant patio sitting area. 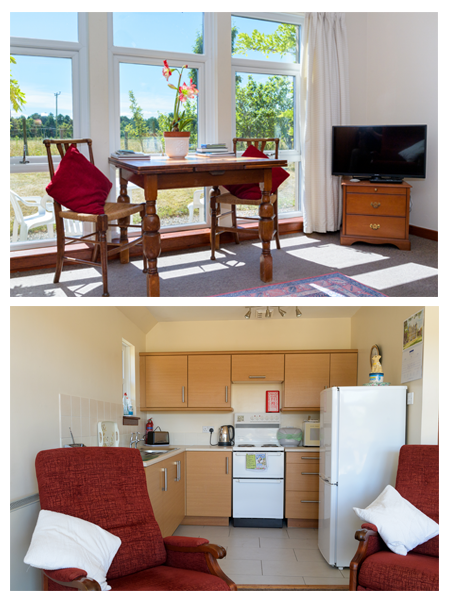 »	Living/dining area - TV, Freeview, radio, books and jigsaws. » Wifi access. »	Kitchen - well equipped with fridge-freezer, microwave and cooker. »	Bathroom - shower, sink and WC. »	Bedroom - comfortable twin beds and wardrobe. »	Patio area - table, chairs and sunshade. "Friendly greeting, comfortable cottage, in a lovely setting plus wildlife and good weather, so we have had a great week here. Will miss the view." "Another wonderful holiday: fishing, sightseeing and sunshine most days to sit and enjoy the peace and quiet." "Comfy and cosy cottage, delightful and peaceful setting." "We had another great week. The walks with the dogs are superb and the wildlife we see a thrill."